University of Göttingen Alumna Lauren Mason shares her top five tips on how to prepare for a career abroad. As part of the Alumni4Students 2018 lectures under the motto "Career Beyond Borders: How to start your international career!" she shares her advice in a blogpost. Even if you’re based in Göttingen to pursue your studies, that doesn’t mean you can’t already get involved with organisations which have an international reach. Joining well-known organisations such as JEF, AIESEC, ESN, or even a youth political party can open doors to a broader network across Europe. It doesn’t require you to leave the city (or even to leave campus most of the time), but it is a great way to add an international twist to your CV. You might think that an international career requires you to speak many different languages. That is true, but in the professional context, employers won’t be interested unless you can actually write emails, reports, and give presentations in that language. So if you’ve browsed the ZESS catalogue and you’re hesitating between that B2 French course and that A2 Italian course, because you really enjoyed last year’s holiday in Tuscany…choose the French. While learning languages is great for your cultural horizons, prioritize quality over quantity, if you’ve got an international career in mind. Today they are your classmates; tomorrow they will be your future colleagues. You’re really passionate about development policy? Take the time to get to know all of the other students in your international development class. Mix with people on the other side of the lecture theatre in your international relations course or join your university´s alumni network. Your flatmates and Netflix will still be there when you get home. But in lectures you are surrounded by a group of young, educated people who are all interested in the same topics as you. (Don’t know where to find them? See point 1). After all, networking is just a fancy word for socialising. The best news comes last! This one is from personal experience. If you want to sound like you’re interested in international affairs and what’s going on in the world, swap your next trip to Spain for a sojourn in Armenia, or Belarus, or Macedonia. It’s a great talking point in interviews or during networking events that sets you apart from those who only travel in the pages of the newspaper. They can often be less pricey than Mediterranean holidays anyway…can’t promise as much sunshine though! Lauren Mason studied MA Euroculture: Society, Politics and Culture in a Global Context in Göttingen and Strasbourg between 2015 and 2017. Before coming to Göttingen, she read Modern and Medieval Languages at the University of Cambridge and undertook internships in a cultural institute in Berlin and at the European Commission’s DG for Education and Culture. 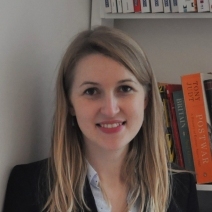 After graduating from Göttingen, she worked at the Council of Europe in Strasbourg and is now based at the European Policy Centre in Brussels.